We are excited to introduce our latest guest blog post coming from Tricia Pettigrew. She is a teacher, mama, wife, and friend. She's a busy woman who has been able to define what balance really means for her, and what being present each day looks like. We loved hearing her story of how to show herself grace, how to focus on what's most important, and how having a fridge stocked with nutritious Guiltless Goodies has helped her and her family. We hope you enjoy her story! Hello, Guiltless Friends! My name is Tricia Pettigrew and I am a life coach, role model, motivator, mediator, negotiator, reality checker, cheerleader, event planner, tear wiper, shoe tier, chaos coordinator and a big hug giver just to name a few. I am a school teacher. I put my teacher hat on in the morning, and, at 3:10pm, my mama and wife hat come on and it is just a sweet continuation of all that I have going on in my life. A friend recently asked me “how I do it all?” I will tell you, a lot of talking to God, patience, grace, an exceptionally supportive husband and Guiltless Goodies. I used to struggle with balance. Me time. Friend time. Kid time. Wife time. There’s just never enough time to meet the needs for each one! So what I would do was, put a little energy into each sector in my life each day because that is what balance is; that is what balance should look like, right? Wrong, actually. Focusing on meeting the needs in all areas in my life was affecting me and was a constant daily struggle. I used to believe that if I give too much in one domain, another domain would suffer. With that mentality, I would then try and not spend too much time in any one domain but instead, give a little to each to “create balance.” Living in this false sense of balance, I was actually neglecting matters that needed a little bit more tending to on that particular day. As I continued this pattern, my life felt out of whack and my purpose unclear. Living life trying to please all and give equal time and commitment to all aspects of life is hard. It’s not purposeful and while you’re trying to feed each area in your life every single day, you’re helping to breed unnecessary stress for yourself. One night, after a heart to heart with my sweet husband letting me know I needed to let some things go, (because by that point my busyness was starting to take away from our relationship and for us, we promised that nothing would or should ever be more important than maintaining US) I had a moment of clarity: I only have so much emotional energy each day. Do not fight battles that don’t matter. Do not choose to spend time on something that does not uplift you or make you feel good as a person. Instead, prioritized your life in such a way that you target what means most to YOU, and feed THAT each day. Not only will you feel more fulfilled, but you will also learn that your days will look different and you have to adjust. And that’s okay too. By fostering this immense shift, I started listing my values, goals, and priorities (and let’s not forget a lot of prayers, self-reflection and taking a good look at how I felt after my day). I learned from that moment on, it was necessary to set my intentions at the start of every day because this was a new practice to me and I wanted it to eventually be as easy as breathing. At the start of every day, I would ask myself these two questions: what is most important, and what really matters at the end of the day? It was an epiphany for me in that I realized each day is very different from the next and I may have different needs with each given day. However, a few things remain constant: being a good Mom, wife, friend, and teacher. So how does that look? Well, like I mentioned earlier, I have shifted my mind from believing I needed to give a percentage to each domain every day, to prioritizing and filling the most important things in my life with my energy, care, and love. Oh, and creating space -sometimes lots of space- to allow myself forgiveness and grace, because let’s be real, it’s a daily practice and I often times fail. But, aren’t self-awareness and forgiveness beautiful things? Yes, they absolutely are. With that realization that I can feed the areas in my life that matter most, the other areas’ needs will be met in some way or another and if they’re not, well, insert grace ☺. I now know that I don’t always need to be getting stuff done and it’s okay and absolutely necessary to shut down and rest. It is about listening to yourself and your body. You make your own rules and follow your own path. Over time it has become abundantly clear when I say I feel as though I can navigate though each day with clear goals and a more positive attitude confidently. After learning to prioritize what’s most important, I have more time to create ways to feed the most important areas in my life. Figuratively and literally. You have most likely heard the phrase: It is better late than never to learn new things. I am grateful to have learned how to balance and prioritize properly before having my two babies and returning back to being a school teacher. I have two, amazing, beautiful children of my own and then I have twenty two amazing, beautiful school children that are mine too. When I say that my life is busy, that would be an understatement. Being a full time Mama, teacher, wife, and everything else in between is extremely time consuming, fulfilling and EVENTFUL! With all that you have going on, you might feel like you’re in a continual state of busyness and hurried-ness and you may find that simplifying might settle you in more ways than you’d expect. Insert Guiltless Goodies. I cannot tell you how many times a dark chocolate donut saved me in my classroom when I did not have a chance to eat, or revived me during a staff meeting on a Monday afternoon. When my kids are hungry, handing them a Guiltless chocolate chip cookie that is rich in fiber, seeds, no artificial anything, both kid and mama hearts are happy. Every week I buy my packs of donuts and cookies. It has become a necessity in our household and in my school (even a few of my coworkers are hooked!) I am so beyond grateful for the nutritional benefits of Guiltless Goodies products and even more grateful for it curbing my terrible sweet tooth! I am thankful I can grab snacks on the go and feel good about it. There are times when I do not have a chance to eat lunch or anything at all during the day (it seriously happens!) and having a Guiltless donut in my fridge or cookies for mid-day snacks help keep my energy levels up, my tummy full (for hours) and my moods consistent (thank goodness because being “hangry” is not pleasant). I am especially thankful for Guiltless Goodies and the nutritional benefits it has to offer for everyone around me whom I have shared with and who I love dearly. Having food that is enriched with goodness, healthiness, and a lot of soul is what is necessary for me to function on a daily basis to be the best possible version of myself that I can be. With a full belly to tackle the day I can do anything with a clear mind, vision and purpose. Thank you, Lindsey, Daniel, and the entire Guiltless Team! Your dedication and hard work helps so many beyond your reach and on behalf of everyone munching on your creations. We are SO thankful!! Five years ago I officially learned about my wheat allergy. It took me a long time to get up the nerve to take the allergy test and find out – I was avoiding it because I didn’t want my beloved cinnamon rolls and chocolate chip cookies to officially be off the table. But I had been noticing for a number of years that wheat, refined carbs and sugar were causing skin issues for me, and I needed to know what I was dealing with. So I took the allergy test and the results were as I suspected. Wheat allergy. Great. Now what? My journey started with a lot of research because I wanted to know what foods I would never be able to eat again. Was I really never going to eat another baked good? I spent a lot of time reading anti-inflammatory and yeast free cookbooks because principals in these methods had proven successful with healing the gut. I started noticing trends in these “clean eating” methods – whole foods, low carb, unprocessed, home cooking, lots of fresh vegetables, low sugar, naturally sweetened, and dairy free – doable, but a big change from what I had currently been eating. Clean eating made sense to me and I was willing to do it, but it was important to me that I didn’t feel deprived. I took on healing AND enjoying what I was eating as a fun challenge. I made long grocery lists and spent hours at the grocery store looking through products and reading labels. I experimented with new ingredients and tried out tons of recipes. The failures were many, but the successes made it all worth it. I was healing, learning and even getting to enjoy a few baked goods! I found that every time I read a label that left me disappointed, my creativity would flourish to find a food hack that would satisfy a craving. I substituted, brainstormed and the result was often creatively and physically fulfilling. With time I created a way of eating and a lifestyle that worked for me. In reflection, a lot of what I have accomplished during my years of clean eating is redefining for myself what tastes good. I now prefer fresh, real food to processed food. The reality remains that pretty much every treat that stays within my dietary guidelines has to be made at home. There aren’t many companies making products I can buy, and eating out while avoiding trigger foods is nearly impossible. Over the years I have found a few products made by companies who adhere to my same eating principals. When I find products made by these companies I feel like someone has hand wrapped the perfect birthday present just for me. Guiltless Goodies is one of the few companies out there making treats for clean eaters. My reaction to finding their products was nothing short of elation, not only could I eat a baked good, I didn’t have to make it! Eating clean doesn’t just have to be about the sacrifice. Get creative and find ways to indulge that leave you feeling good. We are so happy that Caryn came to the bakery and became a new customer and friend. Make sure you check out her website and browse through her incredible recipes! Looking for ways to dress up your Guiltless Goodies for Halloween? We've got you covered with a couple quick tricks!! In one bowl we scooped about a 1/4c of coconut butter and 1-2T of coconut oil, heated it in the microwave for 30 seconds and stirred together. We poured the melted mixture into a ziplock bag and snipped the corner to create a pastry decorating bag! Next we made twp small dots with melted mixture on our Cake Donut, then added mini chocolate chips for the eyes of our mummy donut. Then we drizzled the mixture back and forth creating the "bandages". We did this in two layers so that the mixture didn't all meld together. Let your first layer of bandages set up for 1-2 minutes then go back with a second layer. Not only is this mummy the cutest little donut, but its healthy too! Preservative free and made with all natural ingredients, does it get better than that?! We used the same melted coconut butter + coconut oil mixture and made spider webs on our Chocolate Glaze Donut. 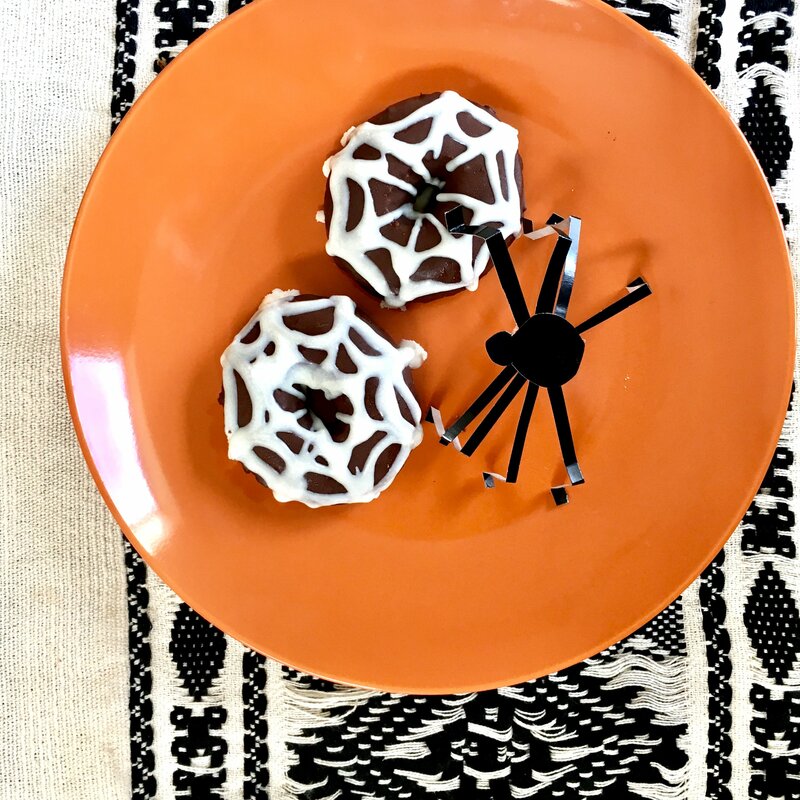 Our little spider is just scrap paper cut and put together using scissors and tape, but you could easily use a fake spider you have on hand to add to your plate for a non-edible, fun decoration. 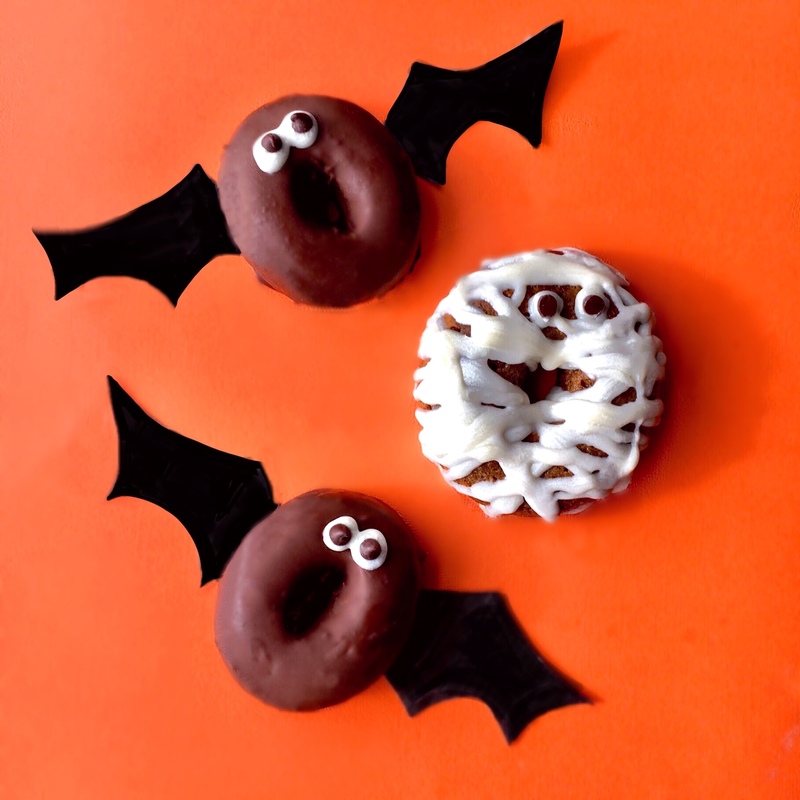 And if you need something even easier, just add some eyeballs and cut out some black paper wings and call our Chocolate Glaze Donuts, bats! We hope you have a Happy and Safe Halloween! Tag us on Instagram @guiltless_goodies if you dress up your donuts! Today we have the pleasure of introducing you to a gal that is spreading knowledge, positivity and light into the world! Lynn Paulk shares with us some simple and practical ways to make small changes in our fitness journeys. We love that she promotes surrounding yourself with healthy options (like Guiltless Goodies!) and keeping a positive mindset. We believe that the way we talk to ourselves is important, so be kind to yourself and take care of your body! You deserve it! My name is Lynn Paulk and I am so excited to share a few words with you! I am a health and fitness entrepreneur. I graduated college in 2016 from the University of West Florida with my Bachelor’s degree in Exercise Science. I am also an American College of Sports Medicine certified personal trainer. I knew upon graduating that I wanted to help people. I wanted to help people be happy. I wanted to help people love themselves and others. I wanted to help people love their body. I wanted to help people realize that they are capable of more. So I started Lynn Paulk Fitness. My passion with LPFIT is to teach women (& men) how to be strong, eat the foods they love, and strive toward becoming their best self. So often when people are not happy with their life, it can be connected to where their fitness, nutrition, and mindset is at. This could be anything from not feeling good or comfortable in their body, a bad relationship with food, a lack of confidence, or even just not realizing their own potential. I use fitness, nutrition, and mindset coaching to help others break down these walls. I know that the struggle is real and paving the way in your own health and fitness journey is easier said than done. But trust me, it is a journey worth taking. It’s not always easy and while we can’t control everything that happens to us, we can choose how we react to it. You just have to make the decision that you won’t settle for anything less than your best self. Feeling good and being happy has a way of radiating into the lives of others. It’s contagious. So find what makes you feel good and happy. Don’t exercise because you’re supposed to, exercise because it makes you feel good and strong. And no stressing over food! I don’t think that food is meant to stress us out. Food is meant to fuel us. When it comes to food, having a restrictive mindset tends to do negative things in our minds. So instead, think balance, moderation, and flexibility. Find foods that you love that also make you feel good. -Do not be afraid to ask for help. Take advice from those who are more experienced, hire a coach, find an accountability partner, etc. -Stay positive. Be happy. Enjoy the journey. -Don’t stress over not being a pro in the exercise department, just focus on moving your body! -No strict diet is necessary, just focus on eating nutritious, whole foods. I love to find brands and companies that have amazing products and are spreading this same message of health, joy, and love. That’s what I found when I stumbled upon Guiltless Goodies a couple of years ago at a fitness expo in Austin, TX. I LOVE sweets, especially donuts, so being able to eat a Guiltless Goodies donut (or cookie or brownie…) and know that it is full of nutritious ingredients that will fuel me and also taste amazing, helps me out so much! And the fact that there are such amazing people behind the brand makes me love to support them even more. Again, happiness radiates, and that’s part of what pulled me toward them (along with their delicious donuts). There is so much more I’d love to talk about and share with you all but I’ll sum it up into a few takeaways for you: Move your body, fuel your body, spread love and happiness, surround yourself with those who love and inspire you, and go eat a donut, I recommend a Guiltless Goodies one! Thank you for sharing, Lynn! We just love her outlook on health and wellness- so much positivity and encouraging words! We hope you will give her site and instagram a visit if you're curious about learning more. Let Lynn help you if you're ready to take the next step in your journey, and let US help you fuel your body. We have a new guest blogger and her story is one of positivity and inspiration. Zoe Palmer tells us about living with Type 1 Diabetes and how our products have become a staple in her diet. If you're unfamiliar with Type 1 Diabetes we've included some visuals we pulled off the web that help explain how it can affect the body. We hope you enjoy hearing her story! Be sure to check her out on Instagram and give her a follow! My name is Zoe Palmer - also known as @zoeepalmerr on Instagram, and I am writing to share my love and appreciation for Guiltless Goodies! My journey with Guiltless Goodies all started back in April of 2018. I was just a little over a month of being diagnosed with type 1 diabetes at the late age of 20 years old, almost 21. I had honestly been struggling with trying to find a breakfast that was not only good for me and my blood sugars, but that was tasty enough for my cravings! I was a HUGE dessert person before my diagnosis in March of 2018. I thought I would never be able to enjoy anything sweet again without the risk of having my sugars go high UNTIL, I found Guiltless Goodies!! Their products have been a life changer and life saver for me. And that’s not even saying enough. I eat their donuts every single morning for breakfast and have their other treats for a light snack to hold me over until my next meal. Their products have worked so well for me, that I don’t even have to take insulin for them. That is a huge success for me. When I don’t have to take insulin for something I am going to eat, it just feels like a really big accomplishment. After I was diagnosed with diabetes I was eating frozen waffles that were lower in carbs and had zero flavor.. I mean zero... I was having to take insulin for these and my sugars were still going high. Even if I carb counted right, I was still feeling bad. For those of you that don’t know, when your blood sugar goes high you get very lethargic and you get very testy. And who wants to feel that way? I can 100% say, I have never had a high blood sugar after eating Guiltless Goodies. All while not even taking insulin for them!!! Eating their products have really changed my mornings, days, and all around life. After eating my breakfast I feel satisfied, good, and awake! When your blood sugars are in range, so is your mood. Fast forward a couple months later and I was finding out my kidneys had been damaged from being undiagnosed with diabetes for so long. I have really been trying to watch my sodium intake because that can help some with keeping the damage under control. I had already been eating Guiltless for awhile and when I was broken the news about my kidneys I started looking at the sodium in everything I was eating. I can’t even explain to y’all the amount of happiness that went through me when I learned that the sodium in Guiltless products are low. I was not ready to give up the donuts, and honestly don’t think I ever will be. Lindsey and Daniel have created treats that fit well with a lot of lifestyles. And just to make me love them even more, they CARE about how their products affect your body. Being a diabetic that is super important to me, and that’s a big win in my book. What I am getting at is, if you don’t have Guiltless in your life by now, you are truly missing out! I have even gotten my family, friends, and boyfriend hooked on these sweet treats. And my boyfriend doesn’t have a sweet tooth in his body. Since being diabetic I have really started to pay attention to what I am putting in my body and I am so happy that I found Guiltless Goodies. I would be lost and grumpy without them. We are so thankful Zoe shared her experience with us. Above is a photo she sent us of her insulin levels after eating our donuts. She was delighted that her levels hadn't spiked and that she didn't have to take insulin! Simply Amazing! Congrats, Zoe!